Fluoride is a mineral that is naturally occurring in water and other foods. Fluoride is important as it helps prevent tooth decay. Patients who develop severe tooth decay can even suffer tooth loss and need complex cosmetic dentistry procedures such as dental implants, dental bridges, or crowns to revitalize their smiles. Fluoride makes teeth more resistant to acid attacks from plaque, bacteria, and sugars found in saliva. Fluoride treatments come in the form of gel, foam, or varnish. These treatments contain higher concentrations of fluoride than regular toothpaste and mouth rinses. Applications of these treatments vary. Varnishes are painted directly onto the teeth and set within seconds, whereas foams are put into a mouth tray and applied to the teeth for about four minutes. Patients receiving foam fluoride treatments should not eat, drink, or smoke for at least 30 minutes after application. Fluoride gels can be either painted onto teeth or applied with a mouth tray. Gels and foams are generally used for patients who are at high risk for tooth decay, patients with decreased saliva flow, and orthodontic patients. 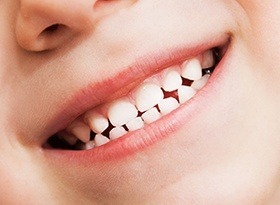 Tooth decay can become a serious problem if it is allowed to progress. Patients may begin to have cavities or permanent staining and damage. Some of these cases can be improved with porcelain veneers or professional teeth whitening. Call Covina Family Dental to schedule a consultation with Dr. Danny Tran to determine your dental needs.